late summer 2018. To learn more, call (805) 400-3057. Some drinks are best served slightly chilled with a rim of salt. Some drinks are best served with a slice of orange peel and a single, round ice cube. Some drinks are best served from a labelless bottle and a lot of laughter in a drafty warehouse where you can nearly see your breath. You can guess which pertains to Two Broads Cider, owned by Morgan Murphy and Maggie Przybylski. MEET THE BROADS From left, Morgan Murphy and Maggie Przybylski of Two Broads Ciderworks are making dry, crisp hard ciders in an industrial neighborhood near Broad Street in San Luis Obispo. 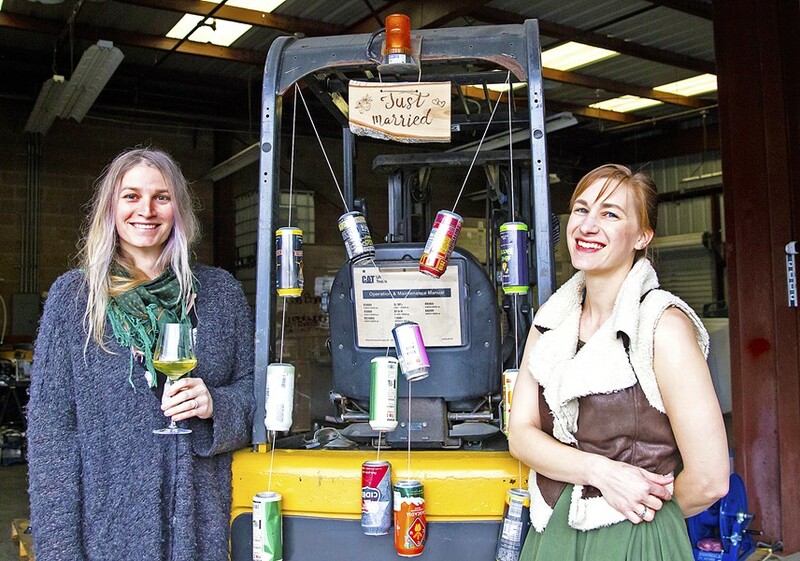 For the co-founders, working together is a dream come true (note the "just married" sign hanging from their shared forklift, adorned with favorite cider cans). Good thing good cider has a way of warming even the chilliest of February nights. Between sips of Bearded Queen—a dry-hopped hard cider named as an homage to SLO's burgeoning drag community—I heard tales of oceanic romance, declarations of creative independence, and thoughts on the ever-cresting "cider wave" splashing across SLO County and the West Coast. 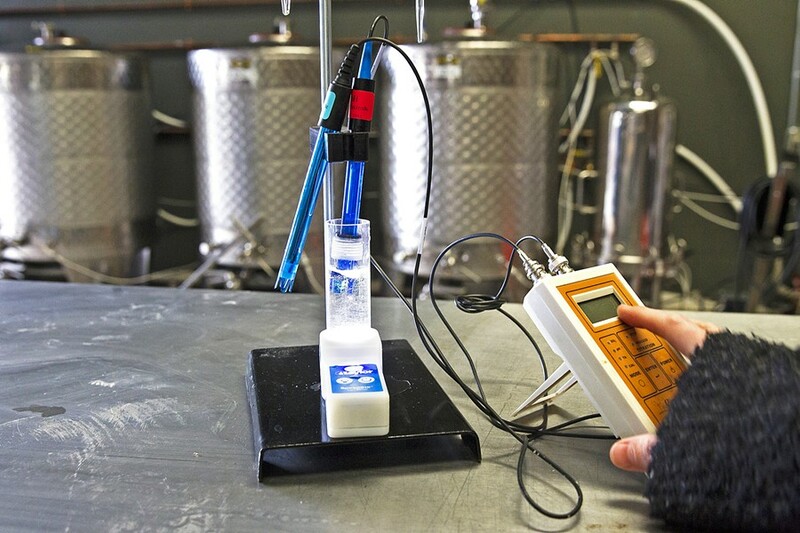 You could blame the tingly-tangy sensation of alcoholic cider swimming in my gut, but as I left that warehouse—located off Orcutt Road in an industrial park not far from Bang the Drum Brewing Co.—I felt totally refreshed, maybe even invigorated. This is the effect of Two Broads Ciderworks. Przybylski and Murphy don't just give you something stimulating to drink. They have a way of stimulating your heart and mind, too. These broads know how to live a little. GOLDEN GLOBES When it comes to crafting refreshing, never-sweet cider, you don't need to look far. Two Broads Cider uses local SLO County apples whenever possible, especially fruit sourced from the fertile See Canyon area. Parked among the silvery tanks and cidermaking gear, I spy a forklift adorned with a handmade "just married" sign. Flanked by dangling cider cans from near and far, this is my first clue that Two Broads Ciderworks is far from an average business. It has been a long-awaited, hard-fought dream. The couple wed two years ago, after about 15 years of romance. 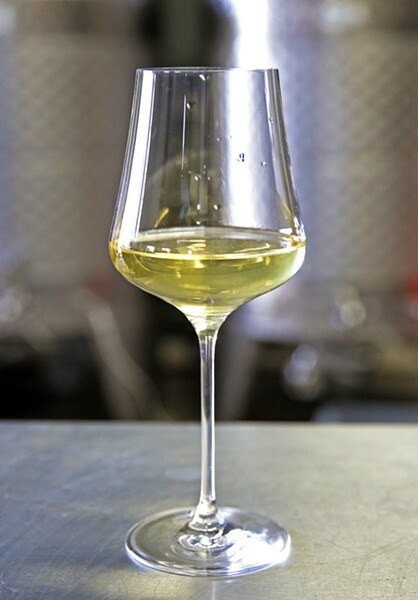 It's a story so dreamy it's slightly unreal—not unlike their cider, which, with its smooth, low carbonation and deep complexity of flavor, has a way of tricking you into thinking you're drinking a really nice chilled, aromatic white wine. The two Cal Poly grads met while enrolled in the now defunct Quarter at Sea program, which took the pair by boat to far-flung lands like China and Guam. "I seduced her immediately," says Przybylski, who was studying biology at the time and went on to become an environmental scientist focusing on the Oceano Dunes. The couple settled in SLO, which was quite a different scene in the early 2000s. Murphy, a computer science major, is now a software engineer for Amazon. Throughout the years, Murphy tinkered with home brewing beer and eventually began moving on to small batches of cider. "One year, we went on a little road trip to See Canyon, drove up there in the fall. It became this tradition to go get apples, make pies, make apple butter, and I would press the juice and I'd make cider," Murphy says. "We got addicted to the heirloom apples!" That addiction has manifested into a zillion hard cider recipes and a few tried and true winners, brewed in 500-gallon batches. You can now find these well-crafted elixirs on tap at 7 Sisters Brewing Co., and Luna Red in SLO. It's sophisticated cider, a combination of traditional, heritage style hard cider freshened by a totally modern approach. In other words, it's not all sweet and it's not all bite. That hopped Bearded Queen cider? It is made with Braeburn and Granny Smith fruit from SLO County fermented to dryness, then judiciously hopped with Citra and Nelson Sauvin. I could smell craft beer-like traits of energizing citrus, mango, black pepper, and gooseberry in my wine glass, which managed to both confuse and please my senses. As the gals are known to say with flat, dry humor: "The Gala Agenda isn't dangerous, it's delicious." Get it? This dry, refreshing cider is made from Santa Barbara-area gala apples and shows notes of stone fruit, citrus, and light spice. Like a boutique white wine, it made me think of all the warm spring days ahead and what I'd want to pack for a day at Montaña de Oro. The Kumquat May (remember that tear-jerker of a ballad "Come what May" from Moulin Rouge?) is a tart, dry, fruity-citrusy minx, with a mix of SLO and Santa Barbara apples co-fermented with organic kumquats. You have to taste it to understand its rebellious, fierce flavor. "We always knew we wanted to open up a restaurant or a brewery, but there's already so much good beer around here, and the weather is so great for growing apples," says Murphy, who does the cidermaking (her wife tackles the marketing and business matters). "SLO already has this amazing history as an heirloom apple region." CIDERWORKS A lot of thought goes into each small batch of Two Broads Cider. With tongue-in-cheek names like "Bearded Queen," "the Gala Agenda," and "Crabby McCrabface," you better believe these lush libations are as modern as they are masterful. Pictured, Morgan checks for pH palance. With local apples ready for the pressing, all they needed was a home. About two years ago, the pair found their perfect warehouse thanks to help from fellow SLOBs, a local home brewing club. The size of the space is ideal—about 2,200 square feet—and there are plans to create a tasting room, utilize a nearby creek for patio sipping, and expand into an adjacent bay when the time comes. For now, tastings are by appointment only, and the gals have their work cut out for them. Even though it's a work in progress, I can see the dream unfolding before my eyes. "We thought, we could buy a house or we could try this," Przybylski says of the big, wild leap. "We got married on a Monday in our kitchen because we didn't want to spend the money." Hayley Thomas Cain is now obsessed with kumquat. She can be reached at hthomas@newtimesslo.com.